Satoshi Kon is like a master mechanic. Give him the parts, and he will concoct a machine that breaks new ground in whatever genre he pursues. In Perfect Blue, he made a seemingly traditional psychological drama that in fact directly attacked the underbelly of otaku-dom. In Millennium Actress, a simple biographical story took us to realms rarely touched in such narratives. Paranoia Agent broke down the conventions of murder mysteries, resulting in a twisty show that never seemed to go where you expected. In Tokyo Godfathers, Satoshi Kon takes a trio of cold, hungry homeless people, and weaves around them a story of hope, redemption, and sacrifice: a story as emotionally touching as it is subtly funny. 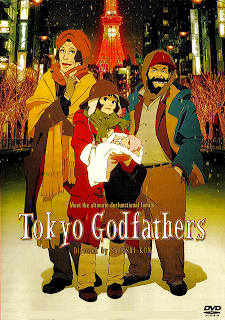 Tokyo Godfathers takes place, naturally, in Tokyo, where Gin, a gambler and alcoholic, Hana, a former drag queen, and Miyuki, a runaway teenage girl, - all homeless - find an abandoned baby in the garbage. It is Christmas Eve, so they decide to try to find the baby's mother rather than simply hand it to the police. The three take the newly-named Kiyoko all around the city in search of her parents, meeting a wide array of side characters and learning about themselves and each other along the way. Unlike Kon's usual fare, Tokyo Godfathers cuts back on the surrealism and takes a more realistic road to reach his classic reality-fantasy split. From the get-go we are hit over the head with striking dichotomies between idealism (a church choir) and realism (a crowd of hungry homeless). Throughout the movie these themes are continued as Gin searches piles of trash under the beaming lights of Tokyo Tower (an important visual motif in the film). The only time we feel the typical Kon come through is in a brief dream sequence where he brings back his traditional identity-confusion and complex symbolism. The major difference between Kon's other stories, however, is the focus on characters over narrative. While the central plot remains strong, with Kon's trademark narrative crescendo/subtle ending combination, the focus of the audience's attentions in Tokyo Godfathers rest very heavily on the three main characters. We are made to laugh with them, smile with them, and sometimes cry with them, as they meet new friends and battle terrible circumstances to bring a baby back home. This central tale, the concept of three pieces of "human trash" being blessed with a piece of unspoiled humanity, is something that we can all relate to in some way. Gin, Hana, and Miyuki are all given fair time to play out their own separate dramas, but Miyuki most surely steals the show. She represents a fascinating and complex parallel in which a young girl runs from her parents, only to embark on a journey to find the parents of an abandoned girl. These sorts of deep-rooted thoughts of home and family that run through the three characters are what hold together the sometimes disjointed little vignettes that make up the story. Gin and Hana perhaps sum up the themes of the film perfectly in one exchange. Gin reminisces about his daughter, telling Hana, "a father never forgets his child." Miyuki, shaken by a message from her father, suddenly storms out of the room. After a moment, Hana adds, "a child never forgets its parents." As we have come to expect from Kon and his go-to studio, Madhouse, Tokyo Godfathers looks beautiful. The backgrounds (especially the snow-covered buildings and streets) are as stunning as any classic Christmas painting, and all of the characters move with a lively and often comical fluidity. Even so, the film suffers occasionally from Kon's traditional character design problem: Most of the male side characters look a tad similar, meaning that audiences will have to pay close attention to understand who's who. Arguably it doesn't have much competition, but that doesn't stop Tokyo Godfathers from being the best Christmas movie to ever come out of the anime medium. Satoshi Kon has pulled together three pieces of garbage, and given them a light to shine their way through the cold and dark. He has engineered a film that finds beauty not in shimmering lights of Tokyo Tower, but in the hopes and dreams of two rejects, the tears of a runaway, and the shining face of an abandoned child.